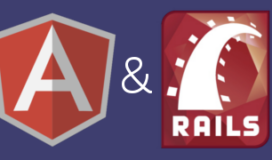 As a follow up to my previous post talking about the benefits of using AngularJS and Ruby on Rails together on your next project. I’d like to go through a tutorial of how to build a simple application using both technologies. In this tutorial, I’ll go over building the frontend (using AngularJS) and how to integrate with your Rails backend as created with my previous blog post. You can also start from the beginning if you’d like. You will need to have gone to my previous post to create the backend application, using Ruby on Rails and PostgreSQL for the database. You will also need to have Node and Node Package Manager (NPM) install on your local, which we will use to install other dependencies. 4. After going through the basic terminal prompt with the generator, it will create all the necessary files in the “client” folder. Navigate to this folder with your terminal, and run the following command to run this Angular application with Grunt. 5. If everything was run successfully to create and run the application, the basic app will open in a new tab within your default browser. 2. Now within your “client” folder, locate the “scripts” folder. You will see 2 things: a “controllers” folder & an app.js file. The app.js file is your configuration file for your application, which will help you inject your 3rd party dependencies and with Yeoman’s example let you define routes within your application. This is the name that identifies your angular application. Without this, you will be unable to add the other services in different files or build correctly. 1. Navigate back to your “scripts” folder and create a factories.js file. In this file copy/paste the following code. This code depicts a factory that is being added the client clientApp. A factory is a type of Angular service that is used to add properties to an object and return the object. In conjunction with the $http service we injected in it, it will let us perform HTTP requests, add the results to an object, and return that object. As you can see in the snippet above, the controller is injected with $scope and MainFactory. We will use $scope when interacting with the view, but MainFactory will be used within the getCheckins function. The getCheckins function gets executed on instantiation of the Main Controller. The getCheckins function consists of calling the MainFactory’s recentCheckin’s function and loads a recentCheckins $scope array variable on success of the factory’s function. That $scope variable will be accessible on the view that is bound to this controller. As you can see we bind the block to the Main controller using the ng-controller directive. We define a table and repeat the recentCheckins array using the ng-repeat directive. This is where $scope comes in. Since we have $scope accessible in the controller, the recentCheckins array becomes available on the view without having to access the controller directly (There are alternatives to using Scope, but I think it looks the cleanest). Then to format the date column’s data, we are using an Angular filter. 4. Well without data, the “recent 25” table will be pretty barren, so let’s add a way to interact with adding data to the model. Two components will be necessary: 1) We will need to capture information about the user’s browser and make it easy for our app to consume (which I copied from a wonderful StackOverflow post). 2) We will need to interact with our other MainFactory’s checkin function, which will POST data to our backend. As you can see, in the success callback of the checkin function we will call getCheckins, which will reload the recentCheckins array. The cool thing about AngularJS is that we don’t have to do anything else besides reloading the array to refresh the table. Take a second, and say hello! Using the ng-click directive, the checkin function will be executed on button click. This will then feed into our backend method and on success refresh the table to show the latest checkin. 8. Everything should now work to create checkins and view the last 25!